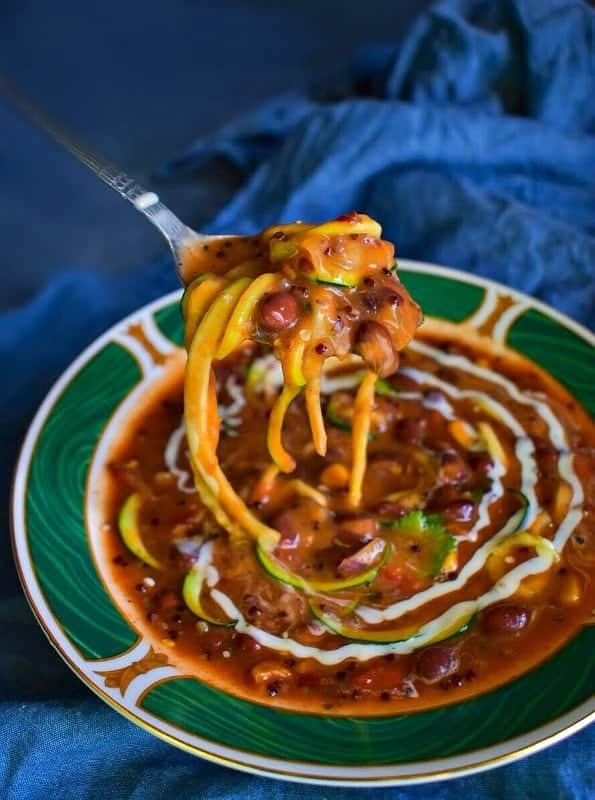 Instant Pot Vegetarian Chipotle Lentil Zoodle Soup: Extremely Easy, filling and extremely delicious soup with smoked chipotle flavors mixed with lentils and topped with zoodles. It makes an easy-peasy meal/office lunch and can be kept in the fridge for 3 days. 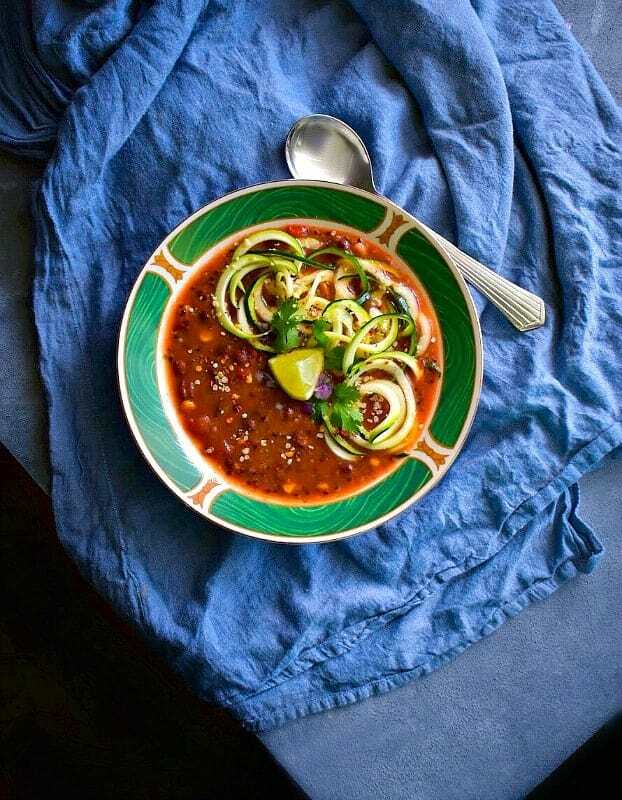 It’s been so dreary and breezy in the bay since past few days that this warm, bubbling Instant Pot Vegetarian Chipotle Lentil Zoodle Soup has become one of our MOST Favorite Weekday Meal! B) It’s absolutely healthy and refreshingly delicious. After a completely BINGED holiday season (which started Oct and lasted Dec), we have increased the intake of plant proteins + veggies in our meal. It not only give us the needed energy along with benefits to go through the day but also helps us feel full yet light. 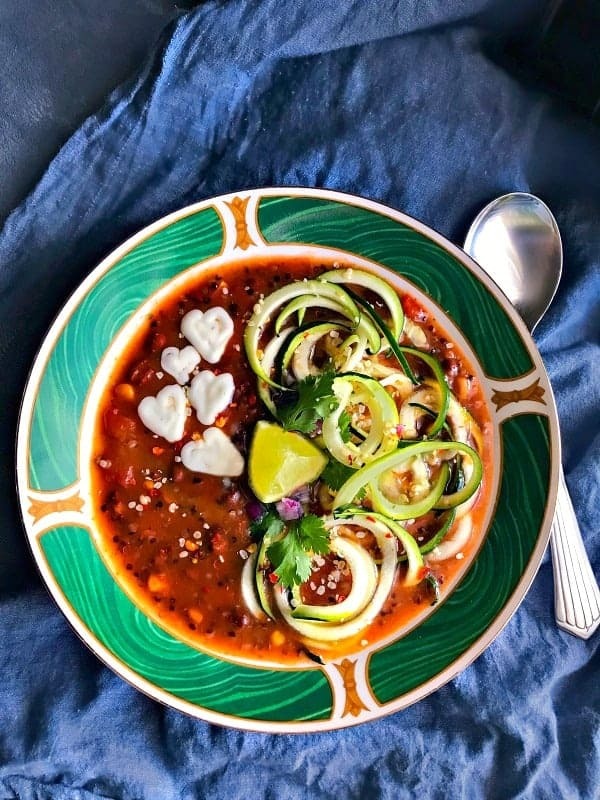 Both Mr. and I, prefer sandwiches/salad/smoothies for lunches and slightly filling dinner which this Instant Pot Vegetarian Chipotle Lentil Zoodle Soup totally qualifies. And trust me, after a long day, when you think of this ‘INSTANT-POT’ hot meal with least efforts involved – It’s like you’ve won a Jackpot!!! Now, we love the soup as it is but topping it with zoodles makes it extra filling and adds so much to the flavors too. I was just being too creative and drew ‘hearts on his and circles on mine’ using some coconut milk that was lying in the fridge. If Cooking this recipe in Traditional Pressure Cooker, simply follow the same instructions you use to make any lentil or bean soups. 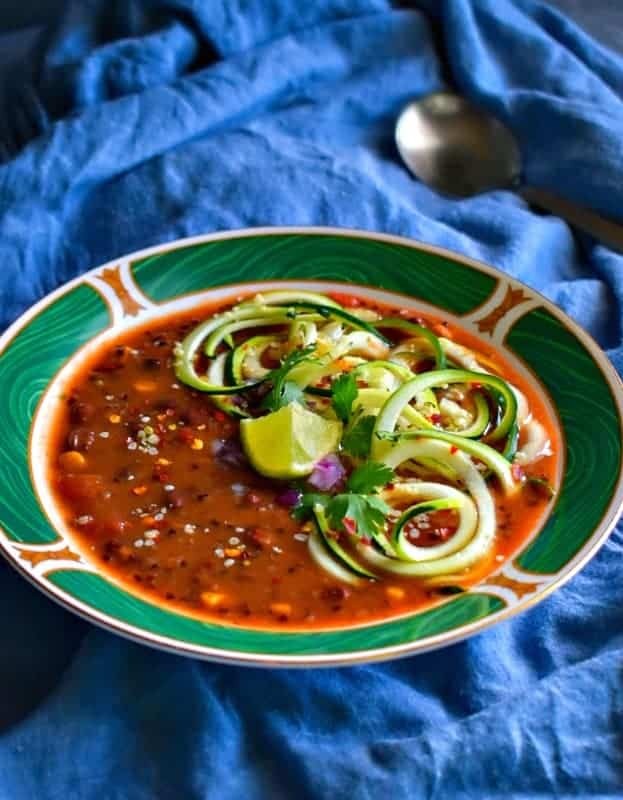 But I’d definitely RECOMMEND Adding this Instant Pot Vegetarian Chipotle Lentil Zoodle Soup to your weeknight menu for healthy and delicious family meal. 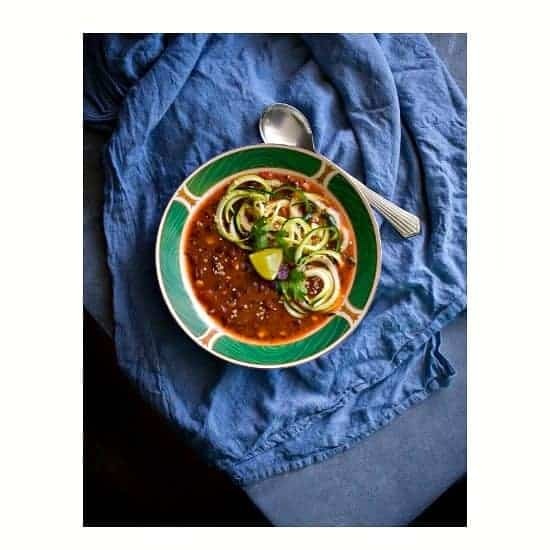 Extremely Easy, filling and extremely delicious soup with smoked chipotle flavors mixed with lentils and topped with zoodles. 2 Medium Zucchini - make zoodles using zoodle machine and keep in water. Set the Instant Pot to "Sauté". Pour olive oil, onions into the pot and saute until brown (2 minutes). Add in the garlic and ginger and stir for another minute. Now add the spices and saute for another minute. Add stock, water and scrape around the pot to mix everything nicely. Add the lentils, bean, corn and quinoa (optional) and stir everything and place the instant-pot lid. Seal the Instant Pot and cook at high pressure (manual - function) for 17-18 minutes. After the stew is ready, allow natural pressure release for at 10 minutes and then manually release any pressure. Open the Instant Pot and give the soup a good stir. ***( You can taste-test at this point and add any required seasoning/broth). Transfer to serving bowl, top with zoodles. Sprinkle some hemp seed, lemon, cilantro and serve hot. * You can use any vegetarian broth but check for them as per your vegan/glutenfree need. Also if both is not available you can use 2 vegetarian bouillon + water. ** This can be kept in the fridge for upto 3 days. 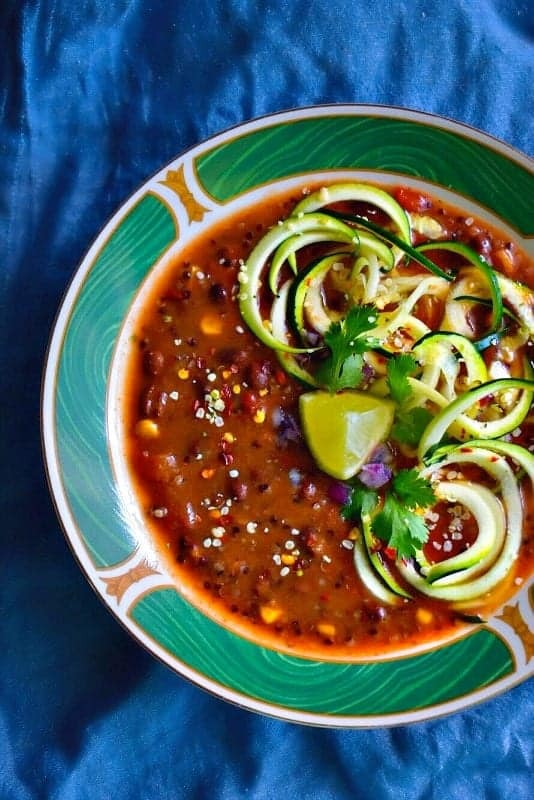 22 Replies to "Instant Pot Vegetarian Chipotle Lentil Zoodle Soup"
This looks so good!! I wish I had an instant pot. All the things you can do with one!! Oh these look awfully comforting, Molly! 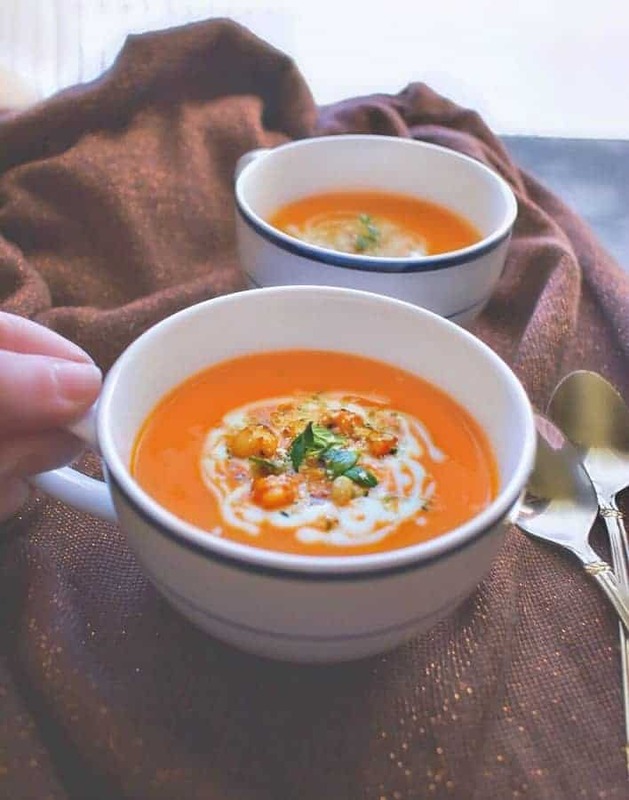 This winter has been absolutely cruel and I am sticking with the soups and chilli and all things warm and inviting! Thank you so much Tina and Stay Warm ! This sounds so incredible Molly. I love Chipotle and lentils especially in this cold weather. This is absolute comfort food. Looks so creamy and inviting. I’ve recently been really enjoying my spiralizer with the kids too. Thanks so much Veena and definitely give this a try. Spiralizer is just so much fun!! Such a sweet touch with those heart! 🙂 I don’t have an instant pot, but this recipe might just turn me ! Such a delicious use of the instant pot! I love how easily this comes together with such wonderful flavors. Yum! Yum! Three of my favorite things–lentils, zoodles, and my Instant Pot. Delicious combination! It has been dreary, hasn’t it? This looks like just the way to warm up (you know, along with the extra socks and sweaters I’ve been living in. Seriously though, anything chipotle and I’m down.